Tied to Graze: They carry full loads of human and other items during the duty hours. During the off hour, their legs are tied and left to graze. The life of camel. 2. In Jaisamler: Early morning haggling 4 Camel Safari. Experienced cutthroat competition betwn hoteliers @ rlwy station. 2nite: Ganga Dune. This camel’s name is Michael Jackson, said our guide/driver. Xu Jie, the Chinese tourist climbs his Everest! 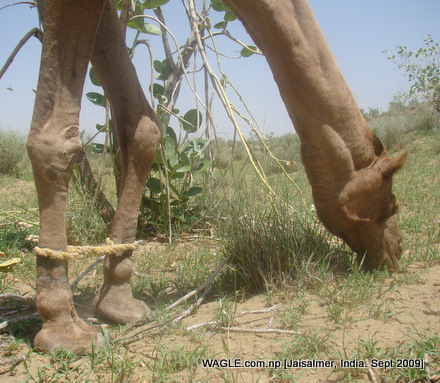 Camels, when not in duty of carrying loads or tourists, are left for grazing with their front legs chained. This happens mostly during lunch hours and nighttime. A sudden drizzle forced us- Xu Jie, DW and the driver/guide- to go under the plastic that was meant to cover beddings and food during rianfall. Xu Jie, left, and DW after naming the hill after them. But it’s not Everest. How can anyone sleep for long in such place and situation? No tent, no nothing. Only thing that was there was FUN. lol，the third video makes me laugh long long time.funny.thanks for the recording ,my dear dinesh.why did u taik lots of details of the iternery ,i mean who cares?hahahahha.